Black lives matter. The Black Experience Is The Human Experience. The front-page story in the Sunday, July 15,2018 digital edition of The Baltimore Sun(“Collapse,” by Tim Prudente, http://digitaledition.baltimoresun.com/html5/desktop/production/default.aspx?pubid=99644e1a-52da-4fe3-8f78-a84e4fe4d386&edid=2192616c-ec73-42b8-a798-f58dedfe23f0&pnum=87),describing the demise of the 900 block of Payson Street, is a decent investigative piece about the real-estate woes of a single block of West Baltimore rowhouses and the recent loss of one human life because of those woes. 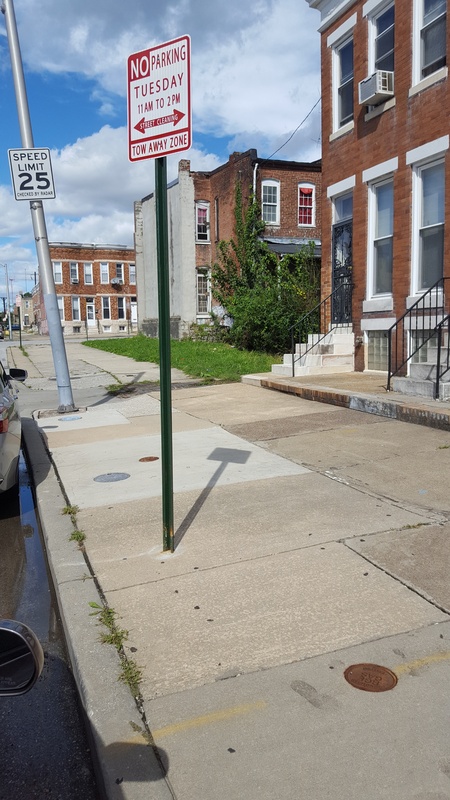 It is one of many sad stories that need to be told in this current era of rotting, dying neighborhoods all over this city. 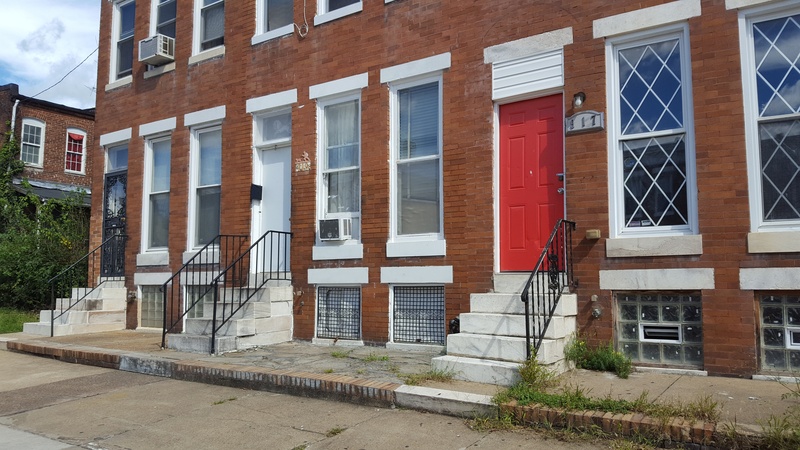 However, my mission as a writer is to tell the human stories of life—not just tragedies—in Baltimore. And I know quite a bit about this block, because I lived there, from 1953 to 1964. My mother’s family, the Barbers, have owned one of the houses in the 900 block of Payson Street for 72 years. 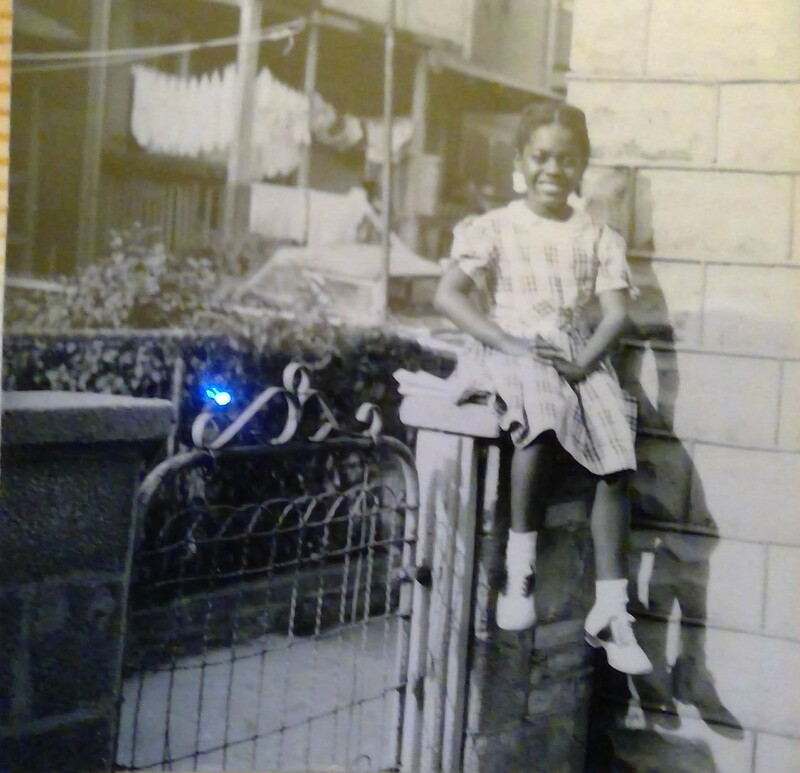 When my grandparents bought their home in 1946, they had three children, all born in the 1930s; my mother, Dorothy, was the oldest, and it was on her 14th birthday that the family moved into the home. Their fourth and youngest child, Florence, was born in the house in 1948 and lives there, still. She and two other neighbors from my childhood, are all that are left of the home-owning families I grew up with decades ago. 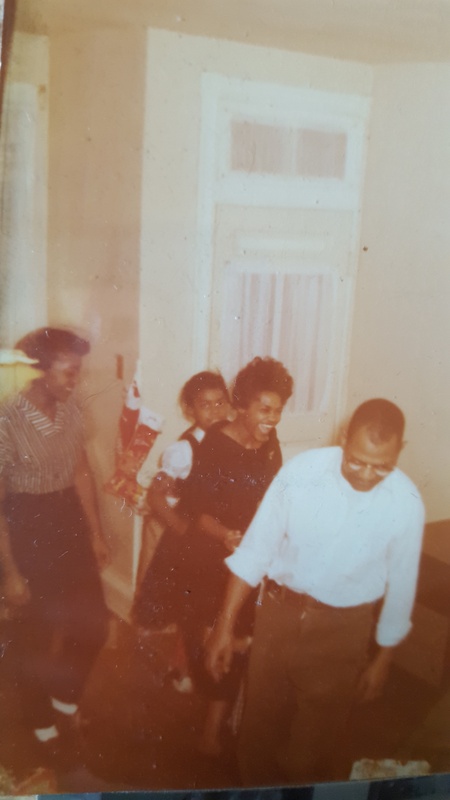 Families like the Troys at 910 Payson (Jerome C. Troy, Sr. was a black Baltimore City police officer), the Taylors (919), the Pollocks (907), the Roseboroughs (905), the Dixons (918), and the Johnsons (920). 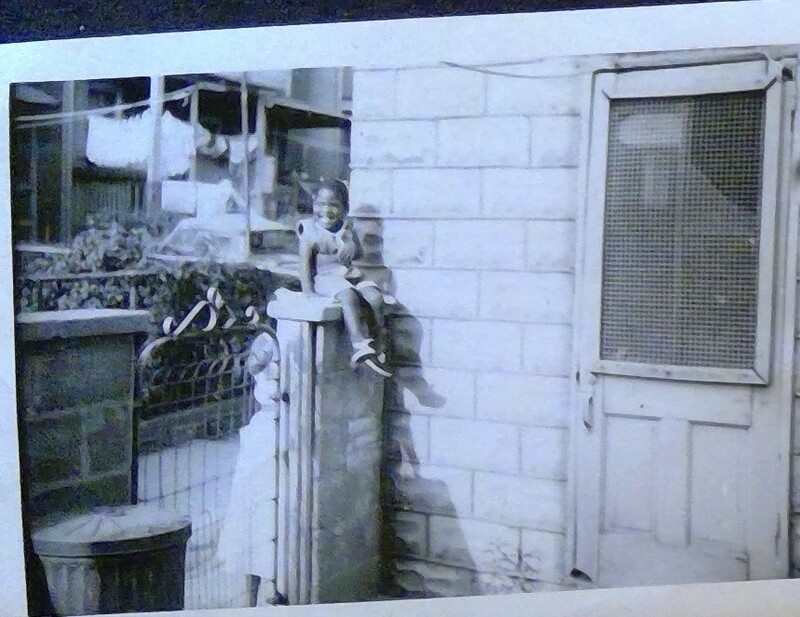 There was even one white family, the Neffs, who lived in this block (909) until the late 1960s. One fact about this block that I only learned as an adult was that it was integrated when my grandparents first moved there! According to my aunt, Lillian B. Scott, in addition to the Neffs, an Italian family lived at 930 Payson. And yes, the Better family, cited in the Sun article, lived in the block. My aunt recalls knowing the sons. All the neighbors got along well, and white and black children played together on what was then a tree-lined block. 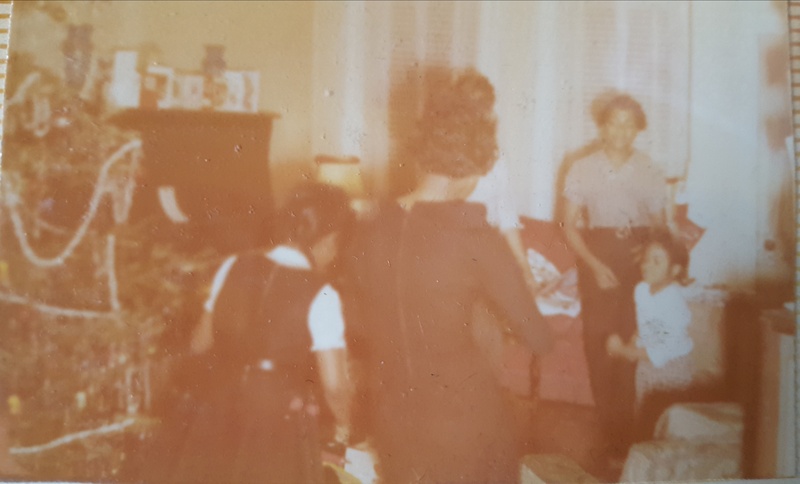 No wonder my mother reacted so calmly when we later moved to Lauraville, a then-mostly white community in Northeast Baltimore. No wonder she couldn’t understand my trials as the only black student in my junior high school homerooms (I was one of a handful of black students enrolled in Hamilton Junior High in 1964). 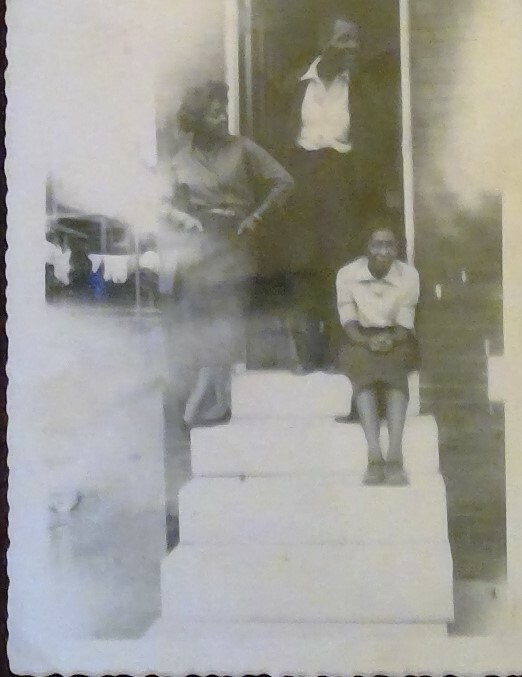 Top: In the doorway, Grandfather LeRoy F. Barber, Sr., Aunt Lillian Barber Scott (Standing left), Grandmother Lillian J. Barber (Seated). Middle Left: Aunt Florence Barber. Middle Right: Jackie Oldham. 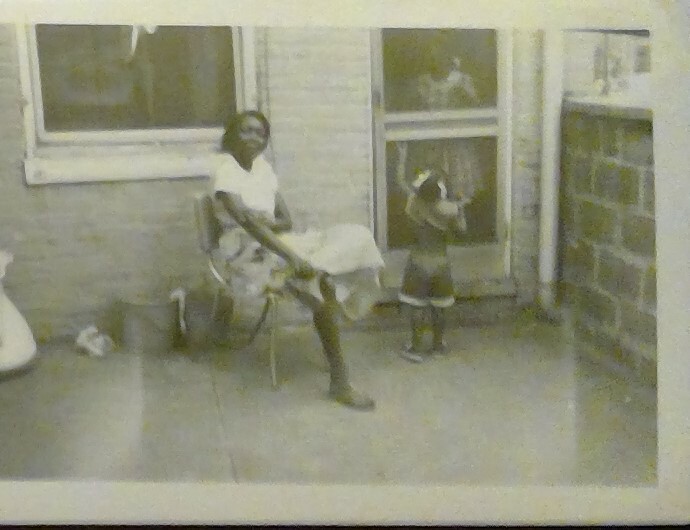 Bottom: Grandmother (Seated), author Jackie Oldham (Standing in front of screen door), Aunt Florence Barber (Standing behind screen door). In the Sun article, the characterization of the Better family, who previously owned the storefront house at 900 Payson Street that collapsed on a resident two years ago, and of the children who frequented his store, was misleading, in my opinion. Yes, children did buy “Yoo-Hoos” (a chocolate drink) from that store; I was one of them; and believe me, that drink was not wildly popular. What we really liked were the coddies slathered with mustard on saltine crackers, onion pickles, and other snacks. 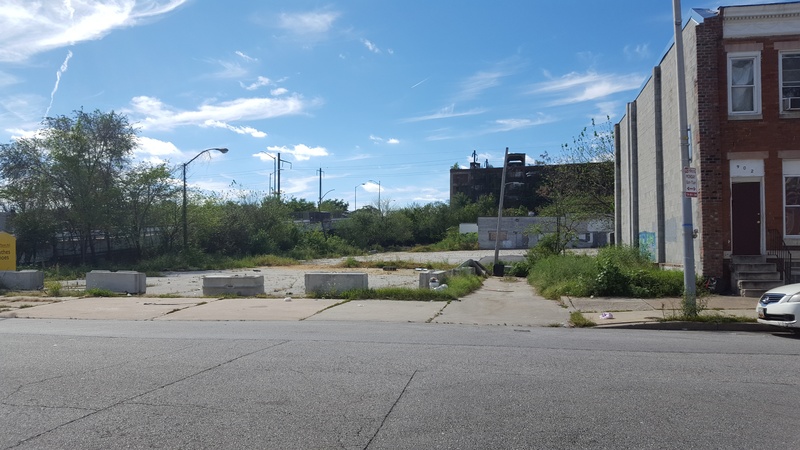 Grassy lot: where Mr. Better’s store once stood; Barricaded lot: where traveling circuses/church revivals were held. But Mr. Better’s, as we called it, was more of a convenience store than a corner grocery. We bought our groceries from Burkom’s, on the corner of Mosher and Monroe Streets. They sold groceries as well as fresh cut or fresh ground meats, and many customers were able to buy their wares on credit. Customer names and their account records were kept in large ledgers, and we kids were sometimes sent to the store carrying the money in an envelope or wrapped in a note to pay on that credit. After languishing for decades after the deaths of the Burkom brothers, that market has reopened in recent years, under new ownership. Across the street from Burkom’s, on Monroe Street, was Waltz’s Drug Store, which we also frequented. There was another convenience store across the street from Mr. Better’s, known as Mr. Dave’s; it later housed Yau’s Chinese Food Carryout; we often went there for weekend dinners when the quality of the food was still good. 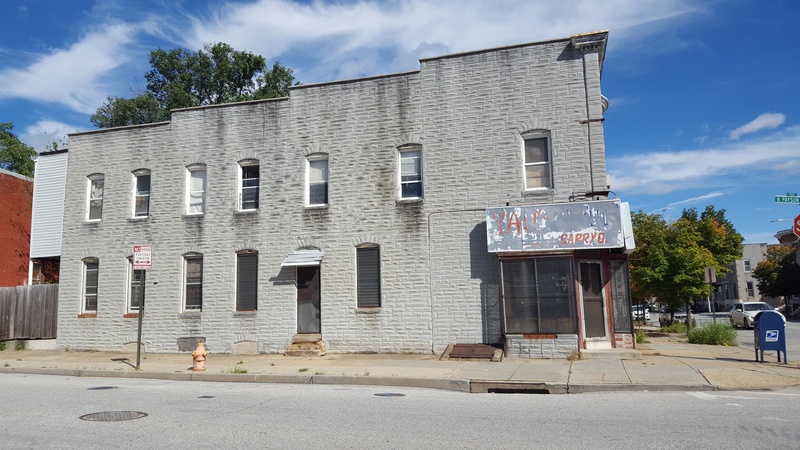 Our favorite dishes were shrimp-fried rice and yat-gaw-mein with pork, which my grandfather jokingly referred to as “monkey meat.” Yau’s also had a carry-out on Greenmount Avenue near 30th Street, in Northeast Baltimore. Yau’s is now out of business in both locations, a casualty of the rise of gangs and guns in Baltimore. The former Yau’s Carryout, which used to be Mr. Dave’s store and home. Yet even Mr. Dave’s store, back in the 1950s and early 1960s, was not necessarily the safest place to go, either! Mr. Dave, who lived in the back of his storefront house with his wife, Florence, and children, along with his father-in-law, Pops, was a white retired policeman who sold caps (for cap guns), candies, cigarettes, and other sundries. Once, Mr. Dave met attempted robbers with gunfire—the only time I remember hearing a real gun being fired on the block when I was young. Pops, who had a bulbous red nose, would sit in the back yard, observing the goings on in the neighborhood. When word on the street was that Pops had a broken nose, kids went running down the street to see it, wondering if his nose had fallen off! But, more important than the stores—and the annual traveling circuses and church revivals that were staged under tents in the lot next to the Betters’ store (in front of the now dilapidated supermarkets that displaced stores like Better’s and Burkom’s)—were the values and education our elders passed on to us: having to change out of our school clothes and do our homework before we went outside to play jacks on the marble steps (which we had to scrub every Saturday) or to ride our bikes and homemade carts up and down the street, or to play step ball, Red Light, and other children’s games, or fun card games like Old Maid, or educational card games like Authors, in which players had to identify the famous authors of classic books. During the school year, the dinner hour was our signal to come inside our respective homes. In the summertime, our signal was the streetlamps turning on. Most of our homes were heated with coal, and we would watch the delivery men as they unloaded the coal down chutes into our basements. My youngest aunt and I sometimes helped my grandfather clear out the ashes from the coal furnace, and in the winter, our snowmen had real coal eyes and carrot noses. 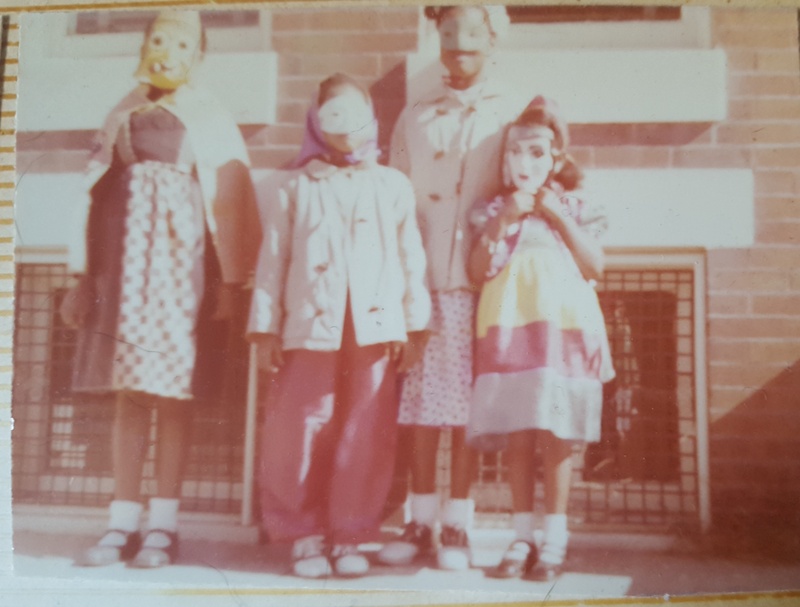 Florence, two friends, and Jackie Oldham on Halloween, masked and unmasked. Coal used to be delivered in those basement windows! Out of this block of “working class” families emerged two generations (my parents’ and mine) of certified social workers, teachers, copy editors, secretaries, and clerks, who worked for city, state, and federal agencies, BGE and the C&P Telephone Company, and other big-name local firms. 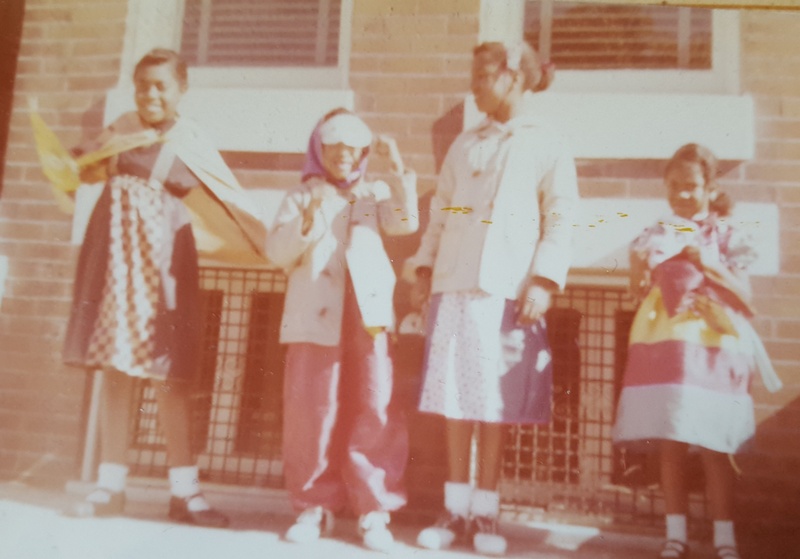 Left: Florence, Lillian, Dorothy, and Jackie Oldham. Right: Dorothy Oldham, Florence Barber, Lillian Barber Scott, LeRoy F. Barber. And although most of the children and grandchildren of this block did move on to other neighborhoods, our elders stayed. We would all come home to Payson Street, to celebrate holidays or have Friday evening dinners and game nights (Scrabble and other board games, or pinochle or Pokeno), watching television or listening and dancing to music on our hi-fi’s. We lived through moments of history: air raid drills; the Salk vaccine; the Cuban Missile Crisis; the first men in space; the deaths of JFK, MLK, and RFK (my Dad, my grandmother, and I walked up to the railroad tracks at the end of the 1000 block of Payson to get a glimpse of RFK’s funeral train in 1968), and so many other events of note. Our world really changed after the 1968 riots. 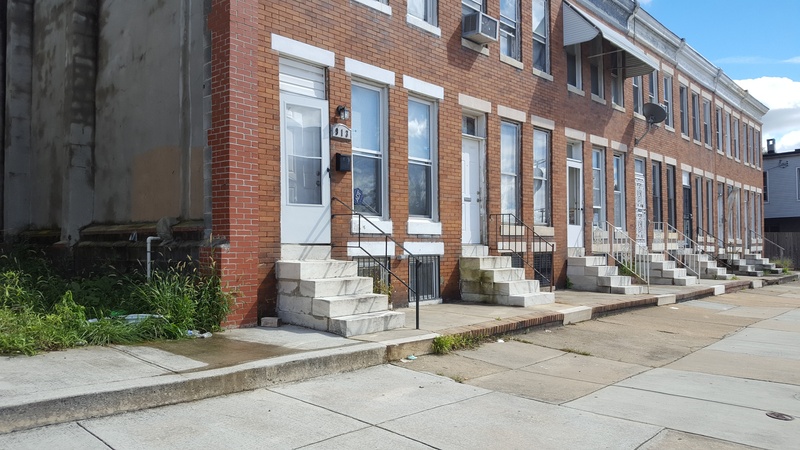 Our neighborhoods were eventually abandoned, as much from the neglect of our leaders—our mayors, our City Councils, and our governors—as from black flight, as families found jobs and homes elsewhere. The photo spread that accompanies this article shows the then and now of this central place in my upbringing. Sadly, I cry, now, for my city and for all the people driven out of her by Urban Renewal, changing economies, and other forces that left us a crumbling, empty mess. God help us. Current views of Payson Street. Left (top and bottom: Contiguous block is broken by the removal of one formerly occupied home. Middle: My grandparent’s home, today. 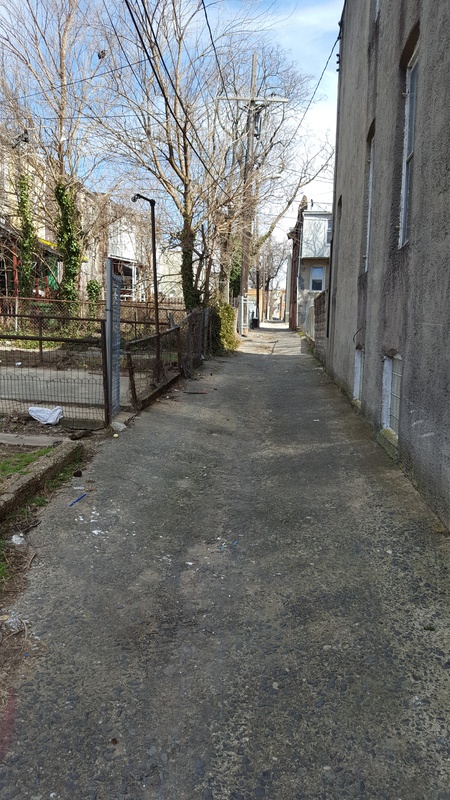 Right: The alley we used to play in, next to my grandparents’ home. This Article Containing Some Of The Best Thoroughly Written Essays Of Any I Have Ever Read…And Is Deserving Of Wide Recognition For Both Its Illustrative And Written Qualities! Terrific and heartbreaking. Thank you! April Is National Poetry Month, and I Haven’t Published A Thing: But Poetry Is Still Happening! The Retirement Party Is Over…. I Need A Job! Welcome to 2019! Wait… What Happened to January?